The history of the glory of the Lord and the temple in Jerusalem makes for a fascinating story. This is one of those subplots of the Bible that we find woven across many books and in both Testaments. It is a complex relationship full of tension, betrayal, despair, exile, and unforeseen hope. Exile is not simply political or geographical or economic. 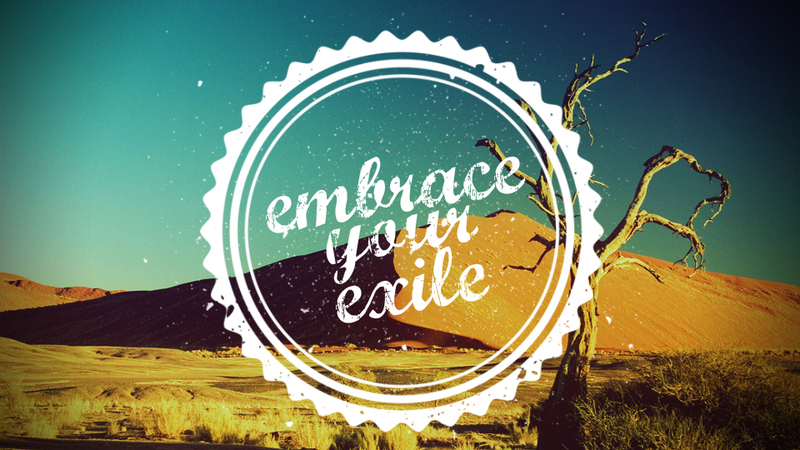 Exile is the absence of God in you and you in God. In this message, which is a part of the series The Hope of God’s People at Grace Church, I tell the part of the story that is most relevant to the Christmas season. Building on the temple construction and dedication stories of 1 Kings 8 and Ezra 6, I follow the story through the eyes of Ezekiel, the prophet in exile. His prophecies portend both doom and glory, a relationship broken beyond repair and yet one that holds the possibility of hope for future reconciliation. The story finds its resolution in a dramatic and unexpected way. An unforeseen fulfillment of Ezekiel’s final prophecy leads us to an exciting new hope and a new way of finding our way home. Ezekiel is calm now, his screaming abated by a dose of valium, a rescue medicine all too often administered these days. His eyes open and close lazily as he passes between waking and sleeping, looking for me, for an anchor, in this strange vacation-house bedroom. We abandoned all thought of swimming in the community pool when the seizures overwhelmed his body, shaking him from head to toe like the last autumn leaf twisting in the cold breeze. He screamed, and screamed, and screamed as I carried him from the pool to the house. Sedated, he is laying on our bed staring blankly at me. Like Elijah and the widow’s dead son, I stretch myself out over his body, kissing his forehead. He clumsily reaches for my ears, gently grabbing hold of one while failing to find the other. I pray to God, “Spare my son. Heal my son. Rewrite his DNA. Repair these broken genes.” For now, my prayers are met with silence, both from Ezekiel and from the Lord. My son has Batten’s Disease, which was forged in the darkest laboratory of hell’s genetic warfare division, concocted by the most brilliant and diabolical mind in the underworld. Batten’s is a fatal, progressive, genetic, neurological disorder that attacks the brain of small children, unmaking them from the inside. Over the course of several years, Batten’s will steal a child’s motor skills, speech, sight, hearing, thought, chewing, and breathing. Before it finally, if not mercifully, takes his life, Batten’s will completely break the child’s brain, leaving him in a permanent vegetative state. There is no cure. Batten’s is UnCreation. If there is anything that fulfills the purposes of Evil, it is this disease that is destroying my son. I cannot describe to you what it is like to look at your young child in the throes of a crippling and degenerative disease and know that, unless God intervenes, this is the healthiest he will be for the rest of his life. All of his faculties are abandoning him. I am overwhelmed by the knowledge that he will eventually be both blind and deaf. Will he be terrified by the darkness when he can no longer see? What will we do for him when he can only lay there helplessly, unable to see, hear, or communicate? My son is dying, and I am full of fear. We have been forced to endure the grief of his slow death this far, and we can only hope and pray that we will not have to endure it until the bitter end. Ezekiel is being uncreated by a satanic disease that, through the reception of two recessive genes from Breena and me, is rooted deep within his genetic structure. In that sense, it is as much a part of him as his brown eyes and hair. So when we pray, we do so with the knowledge that we are, in a way, asking God to turn his brown eyes blue. We are praying for the impossible. We are asking God to rewrite Zeke’s DNA, to repair and restore his genetic code. We are asking God to work on a microscopic scale. Fortunately, we have a God who turned the molecular structure of water into wine. We have a God who restored the genetic code of a man born blind. We have a God who rewrote the DNA of those crippled from birth. And so we pray, begging God to intersect his power with the profound need of our son. If Ezekiel is to live, he must literally be changed at the deepest possible level. If he is to survive, God must recreate what the devil, through this disease, has uncreated. Breena and I are convinced that this is not too big a thing for God to do. But God has not healed him yet. We have been forced to endure the grief of his slow death this far, and we can only hope and pray that we will not have to endure it until the bitter end. I don’t know why he hasn’t given us what we have so desperately asked of him. I don’t know why my son continues to die with slow but agonizing finality right before my eyes, despite the prayers of hundreds of people all over the world. I wish that my hands were holy enough to drive the evil out of him, but everyday I walk the line between faith and fear. Is God silent? Or are my ears deaf to his voice? Is he ignoring me? Or is he doing far more than I can see or imagine? Fear is the result of leaning into questions for which there are no satisfying answers. I simply don’t know if Zeke is going to live or die. When I contemplate the power of God, I have hope that Zeke’s flesh will be healed and he will be set right in this life. There is no doubt in my mind that the God that rose Jesus from the dead is able to conquer this disease in my son. But this knowledge of the power of God cuts both ways: I know that God can, but I don’t know if he will. Ultimately, I find no rest, no peace for my mind or soul, no lasting hope in the contemplation of the power of God alone. He is, after all, God, and he is free and able to do whatsoever he chooses. He doesn’t have to do what I want him to do. Where, then, can my soul find rest in the midst of all this suffering? In this: Jesus is the God who has suffered. I follow the God who knows, intimately, personally, and experientially, what it is to suffer as a human being. The God of Christianity is the only God who can say to a bereaved parent, “I, too, have lost a son.” When I contemplate the suffering of God, I have faith that my God understands what I’m going through because he himself has endured the grief of loss and death. In suffering, my love for God grows because now I, too, understand something of what he endured at the cross. Not only this, but my heart is full of hope that, come what may, God is somehow making all things new, including my son. I can find rest in the prayer that God’s will would be done instead of my own, not because I know God is all-powerful, and not even because I know that God is all-loving, but because I know that God has willingly chosen to suffer and die. I can trust God because he is all-understanding, all-empathic. I wouldn’t make it if I didn’t have Jesus. And I don’t mean having Jesus in some casual, half way. I mean fully. There is no greater comfort than to know the suffering God in the midst of our suffering, and the only way to have that comfort is to commit yourself fully to God. I don’t know why anyone would refuse Jesus. You might say, “Won’t you be angry at God if Zeke dies?” I might. But where, then, would I turn? What other god could know my pain? What other god could empathize with me in the midst of loss? What other god has tasted death and come out the other side so that I can be free? Only Jesus. And if Jesus has done all this, then what could any other god possibly have to offer?